Weldflow takes pride in associating with their customer right from the beginning of their product development lifecycle. At times the first phase of a product prototype (Concept Stage) bears little resemblance to the final phase (Design Phase). We help our customers in the design phase by generating assembly model of finished product and generating quick fabrication processes without the requirement of specialized manufacturing tools that may be needed at later stage of production run. 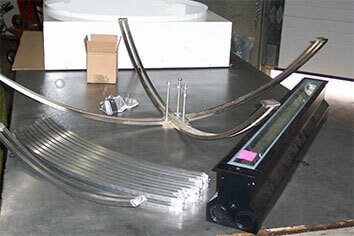 This enables to keep the prototyping production cost to a minimum. Due to our ability to turnaround prototype development and make such production possible, helps our customers in evaluating the feasibility of their product and taking the product to the market place expeditiously. Due to provision of scalability, we can easily accommodate from a small-scale production run to large scale production line, including annual, quarterly or monthly production runs. Such development has intrinsic nature of changes and revisions in a product cycle, as our customer gains more experience in the use of such parts in the field. Thus, this iterative process is easily handled by us through proper document management and revisions incorporated during the part production evolution.